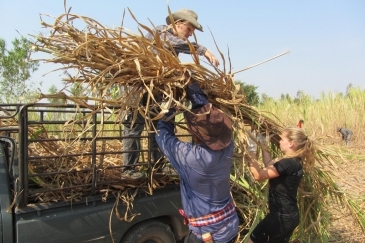 Surin Home Stay - Elephant Volunteer: Main focus is to let the elephants free from work. We brought elephants from street begging to live in their homeland. Volunteers stay with mahouts families in a traditional home stay, learn about mahouts culture, experience Buddhism activity and take care the elephants, offering them a better life. Surin Project - Weekly Volunteer: The Surin Project´s main focus is placement of elephants into more natural surroundings where volunteers can walk alongside them and observe these magnificent creatures in a vastly improved environment. This offers the mahout owners an alternative form of employment away from elephant riding or circus shows which are the common forms of income for many mahouts in the area. 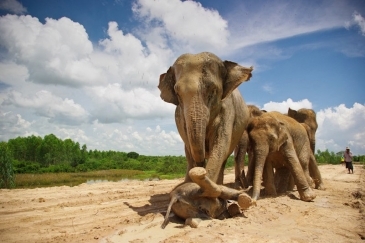 The Surin Project is a unique and innovative concept aimed at improving the living conditions of captive Asian elephants by providing economic sustainability for their owners through responsible volunteer tourism. We work alongside the Gwi community in the government run Surin Elephant Study Centre located in the village of Ban Tha Klang in the Surin Province in North East Thailand. The Surin Project´s main focus is to get some of the elephants in the study centre out into more natural surroundings where volunteers can walk alongside them and observe these magnificent creatures acting like elephants should be. This offers the mahouts who own the elephants an alternative form of employment to elephant riding or elephant shows which are the main forms of income for many mahouts in the area to support their elephants and families. 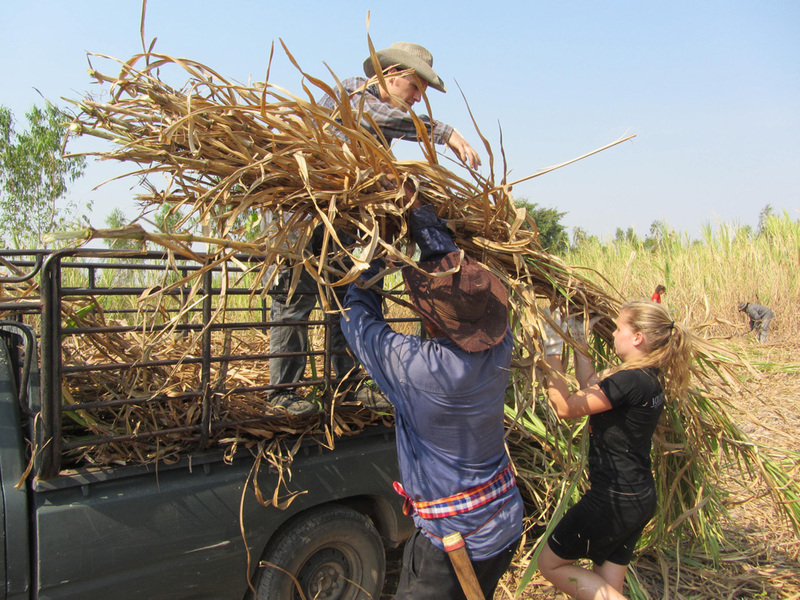 Volunteers coming to the Surin Project should expect to be immersed in the local Gwi culture in the remote village of Ban Tha Klang. Working alongside the mahouts and the local community they will learn more about this unique culture and their relationship with elephants. 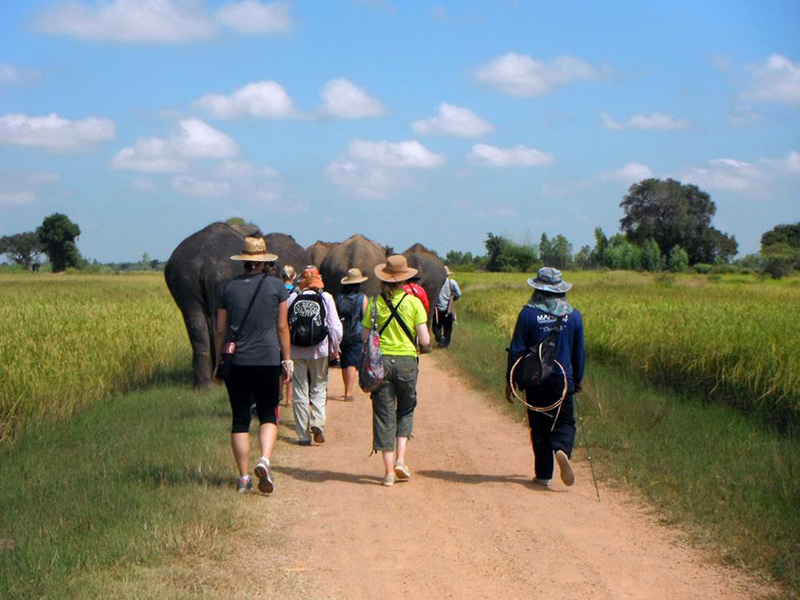 Most importantly volunteers will get a chance to go out on daily walks to observe the Surin Project elephants interacting with each other in a more natural setting without being ridden. During their stay in the village volunteers can expect an attack on their senses and will see some of the realities of how captive elephants can be used in the area. The Surin Project does not own or buy any elephants, the elephants are owned by their mahouts, so how they are treated is ultimately not our decision. The mahouts who join the project agree to leave their bullhooks at home and to take part in project activities. However they are free to leave at any time with their elephant. It´s up to us to provide them with enough incentive to stay on the project and support our concept (we can only do this with volunteer support). There can be between 150-200 elephants living at the Study Centre, The Surin Project can only support up to 12 elephants at a time. Many of the elephants in the area can be used for other forms of elephant tourism in the area such as the local elephant show and elephant riding which we do not support. Volunteers may be exposed to a certain amount of suffering during their stay because of these surroundings and can witness the use of the bullhook which many mahouts in the area use to control their elephants. For many, this may put them off wanting to volunteer here, however, they must remember that with their presence here, they are taking part in something positive, and although it may seem like they can´t do much to help the other elephants in the area they are helping show the mahouts and local community that they want to see a better form of tourism for the elephants. If they don´t see these benefits they will only keep doing what they know. Hopefully, in time as volunteer numbers increase and we show the local mahouts that people are willing to see elephants in this way we will adapt their mindset to be more considerate of the elephant´s welfare and expand our ability to support more elephants and mahouts in this area. 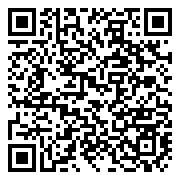 You will be living on site in basic but comfortable same gender home-stay shared accommodation. Volunteers will eat together for every meal. The food is healthy and varied, with a buffet style breakfast, lunch and dinner with many different dishes to choose from. and vegetarian food is always available. All dietary restrictions are catered to. English speaking staff on hand at all times to ensure your safety and be on hand to answer questions and provide you with a practical education about elephants, the culture and anything else you may have questions about. Independent travel costs to and from Buriram (or directly to the project, our staff can help you arrange this at an additional cost. Please see below for more detailsAny additional costs such as trips, snacks, entertainment (allow a few hundred Baht per day depending on lifestyle). The initial maximum 8 weeks may be extended depending on availability and suitability. Any decision of extensions will be made at the end of your stay with us. For volunteers traveling from Bangkok, we offer a pick-up service from the Northern Mo Chit Bus Station (Map) at 7:30am on Monday morning, on the 3rd floor in front of the Dunkin Donuts (NOT the booth), for an additional fee of 500 THB. Own travel to project: For volunteers already in NE Thailand or travelling from Cambodia it can be more convenient to travel to Ban Tha Klang yourself coming via Surin city bus station. Please contact our staff for more details if you plan on doing this as you will need to arrive at project on Monday no later than 3pm. Return after finishing at the project:after Depending on where you want to return to you will either leave on Saturday evening (Chiang Mai arrival around 10am Sun) or Sunday morning – Bangkok arrive around 3:00pm. Other forward transport can be arranged when you are at the project. Essential items: Flashlight, Earplugs, Alarm clock/watch, Basic First Aid kit, personal medication, Towel, personal toiletries, sunscreen, Insect repellant, flip flops, closed shoes, long sleeved shirts and trousers, extra socks. Seasonal gear: (poncho/ waterproofs (Rainy season: June - October), warm clothing, long sleeves, sweat pants, jumper (Cold season: November - February; can get quite cold at night times). Recommended but not essential: reading material, travel games, camera, small daypack, gardening gloves, wide brimmed hat- we can provide gloves and hats on site if you do not have these items. 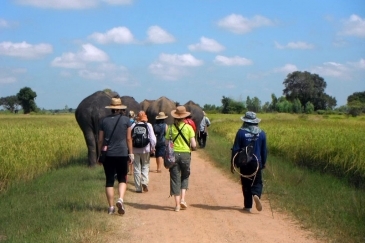 What is Included: Transport from Buriram bus station accommodation, to project and back, Clean, convenient accommodation on site, Three delicious meals per day, A practical education on the challenges facing elephant conservation, free t-shirt and reusable water bottle. Bookings close: Five Days before you are due to visit. A deposit is required to secure your place(s). The cost to volunteer for one week (Monday - Sunday) is 13,000 Baht. Volunteers must be at least 16 years of age, and any participant younger than 18 years of age must be accompanied by a legal guardian.